New blog post after a long time! Feels good to be back and look forward to sharing my holiday experiences with you all. I was away to motherland India for a much-needed break and to celebrate Diwali with family. 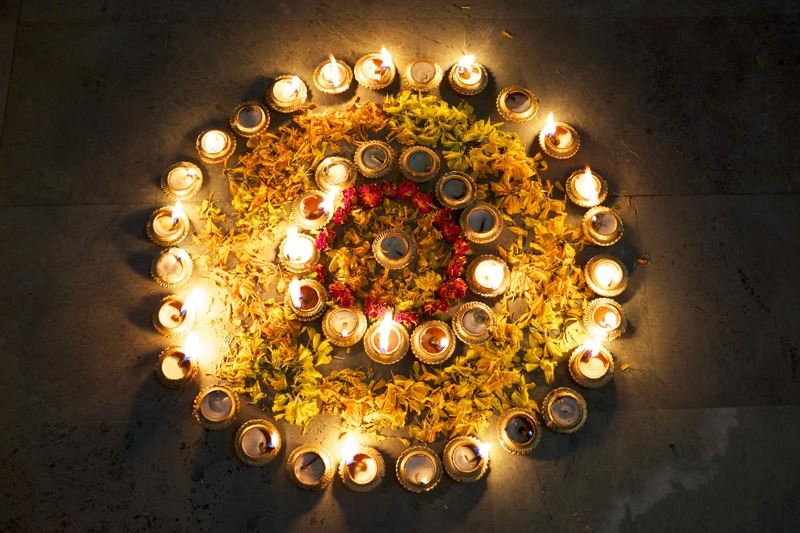 Who doesn’t love Diwali (Indian festival of lights). I am sure Diwali is your favorite festival and you all look forward to it too. 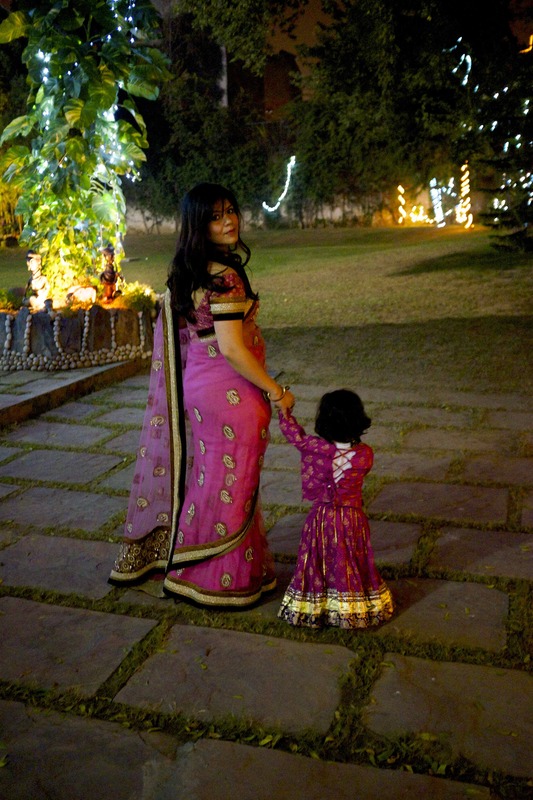 I was pretty excited this year as it was Meera’s first Diwali in India. 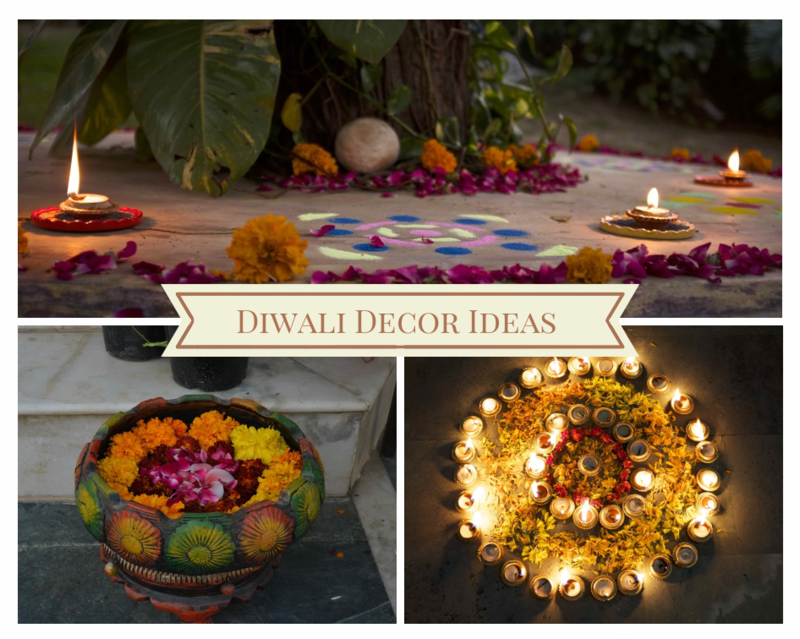 Today’s blog post is about Diwali decoration ideas. 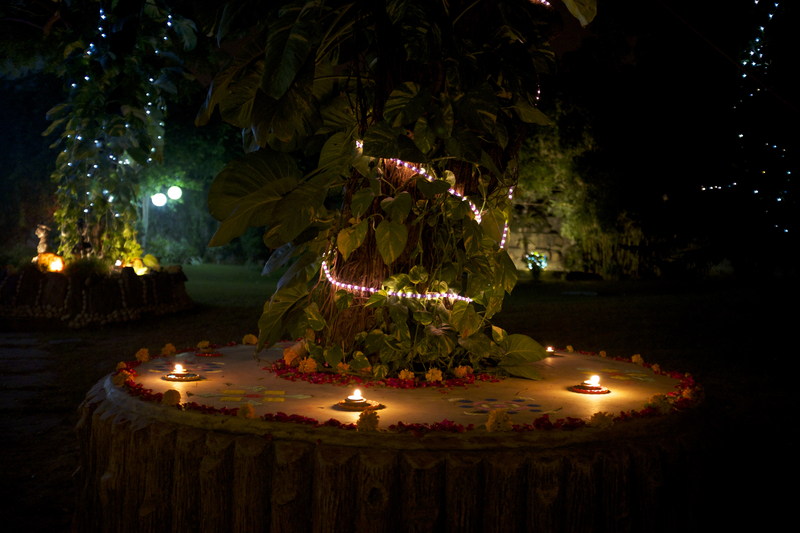 I have always enjoyed decorating the house around Diwali. When we were kids, it used to be a big affair with weeklong preparations and the excitement of trying new decoration ideas every year. I remember decorating the main Diwali thal (round steel trays) and matkas (earthern pots) every year with Mum. These childhood memories will stay with me forever and I hope to transcend this Diwali excitement to Meera. We landed in Delhi two days before Diwali, which meant that I did not have enough time to do an elaborate preparation. With limited time on my hand, I had to be creative and do the best with available resources. For a festive occasion its best to stick to a traditional décor. You can never go wrong with a traditional setting. 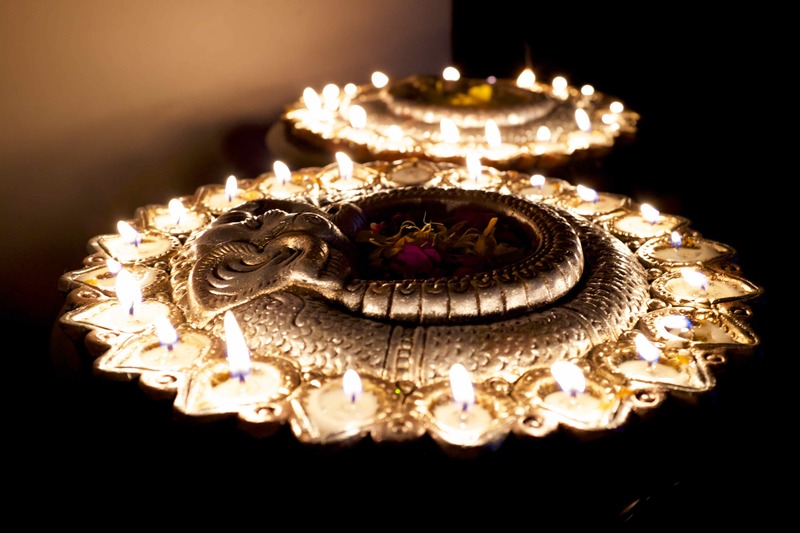 For creating a beautiful Diwali décor flowers and diyas are a must. Even if you don’t have any other accessories or decoration item at hand just put a few diyas and flowers together and you are done. So here a few displays I create this Diwali. It is a common belief that your home entrance should be cleaned and decorated with flowers, diyas and Rangoli to welcome Goddess Lakshmi. 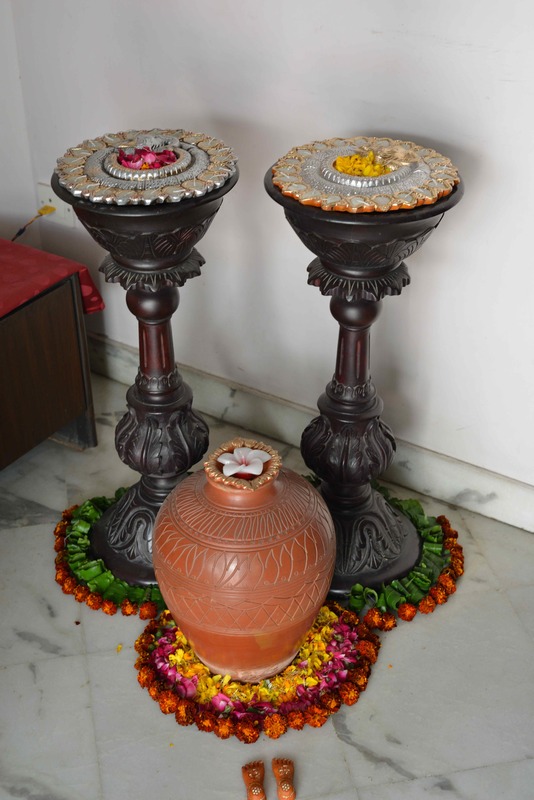 To decorate our home entrance, I created this circular diya display. 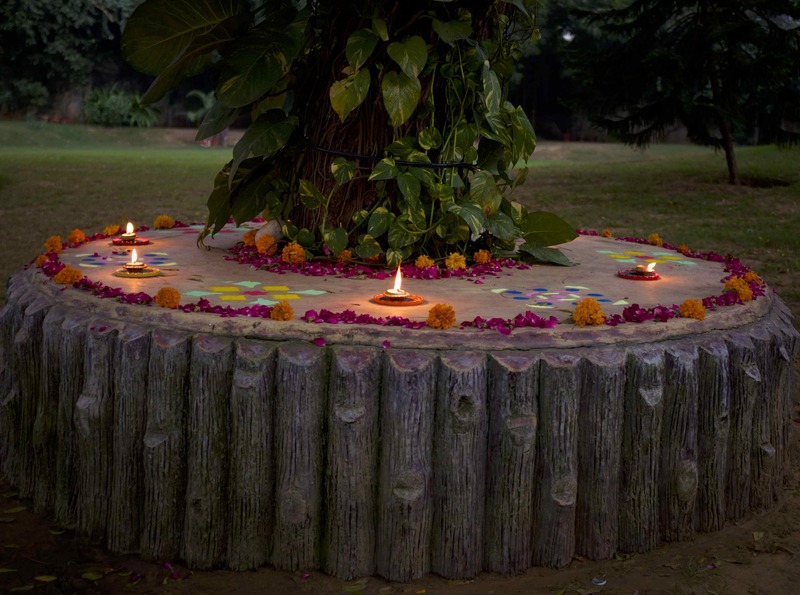 Simply create two circles with diyas and fill the circular shape with flower petals. I also put flowers and floating candles on either side of the main door. 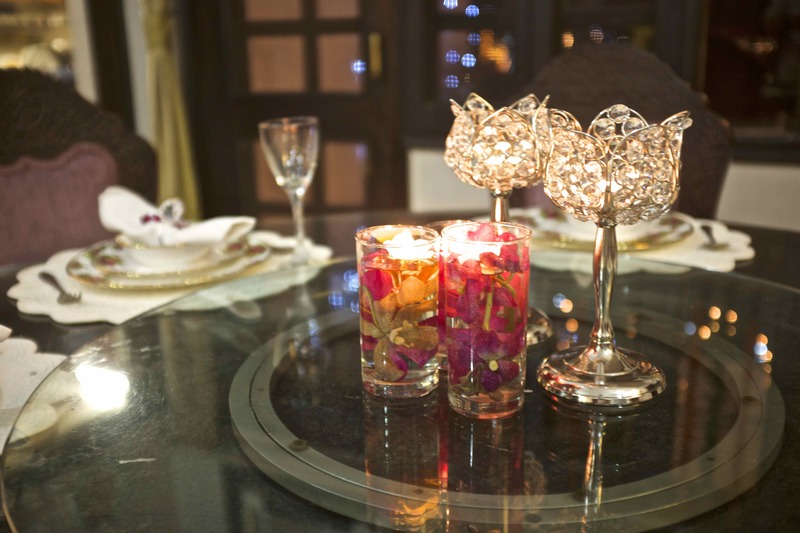 Floating candles add a calming touch and are very easy to create. I continued decorating the main entrance. This time I used beautiful earthen diya thalis available at dirt cheap prices on Delhi roadsides. Diwali market is pretty much half the retail price. I used two tall plant holders and a big earthen pot and flowers to create this simple yet beautiful display. I also decorated the back entrance with this traditional diya stand and flowers. 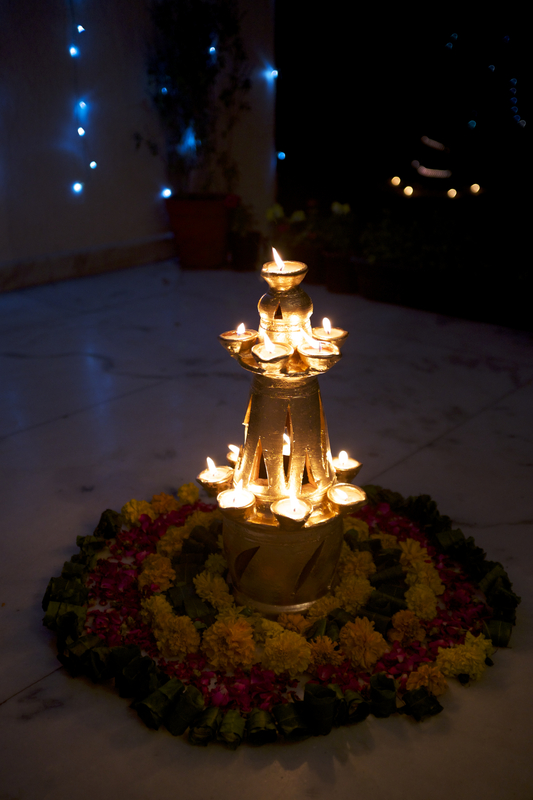 A very classic and traditional Diwali display. Like I said earlier you can never go wrong with traditional décor choices. This is my favourite one. I am lucky to have a beautiful garden at my in-laws’ place. It would be a massive job to decorate the whole garden area, that’s why I chose just one area. This is my favourite bit of the garden – a fabulous sitting area under a shady tree (its called chabutra in Hindi). Initially I wanted to decorate the sitting area with flowers but then I thought of the handy rangoli kit I bought from the roadside market. 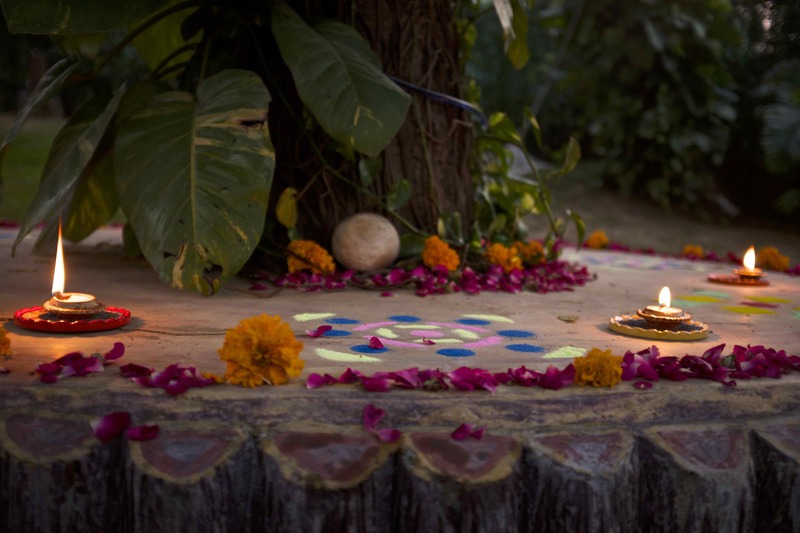 Using the kit I created colourful patterns around the tree and decorated the sitting area periphery with flowers and diyas. The spirit of Diwali is all about being with family and enjoying the festivities together. Living abroad this is the thing you miss most, so make the most of it when you get a chance. 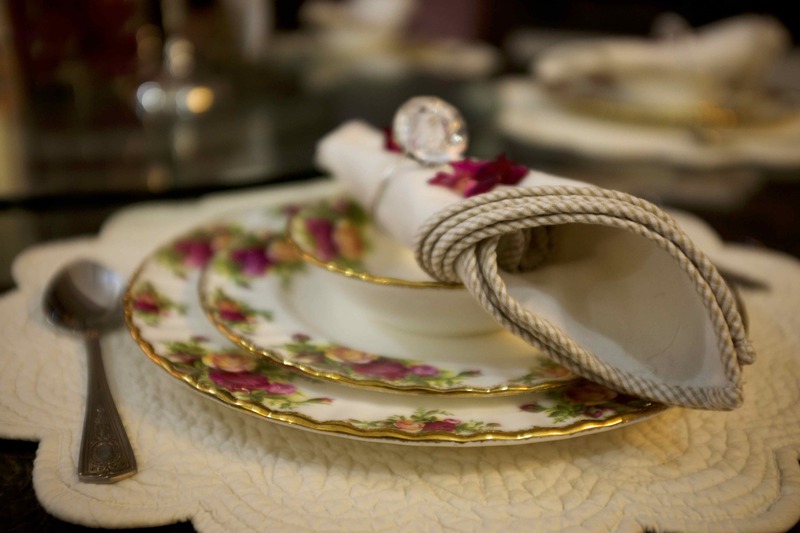 My dinner table had a modern touch to it as I wanted to use the most beautiful dinner set my mother-in-law owns. You can do these elaborate displays only in India. London is all about pot luck parties and tupperware ha ha…..
Love my tall glass and orchid centerpiece. Vey easy to create and offers that calming touch to the dinner table. I managed to achieve the above during Meera’s nap time so you can create the above displays without much fuss. Also one key ingredient is a loving and caring mother-in-law who will give you full liberty and let you do things. Lucky to have one. So what do you think ? Do you like the above decoration ideas? 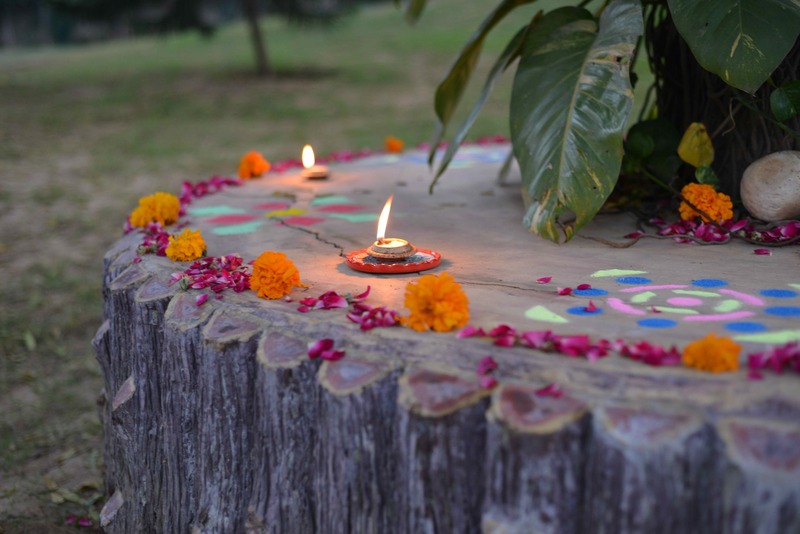 Do leave me a comment or share your Diwali décor stories here.